From July 2010. This was part of a series I wrote detailing some especially memorable summers, and I singled out the summer of 2003 for my experiences in Clinical Pastoral Education. I often think about my time as a chaplain, and I don't rule out the possibility of pursuing chaplaincy at some point in the future. This was a time packed with incredible ministry experiences, and there's something about the hospital atmosphere that makes me feel comfortable, my aversion to needles and blood notwithstanding. I plan to write some fresh thoughts about this soon, but for now, enjoy revisiting this post. By the summer of 2003, I'd been living in St. Louis for two years and had completed two out of three years of seminary. By this point, I'd come to love and appreciate life in the big city with its vast array of entertainment options and diversity of cultures. 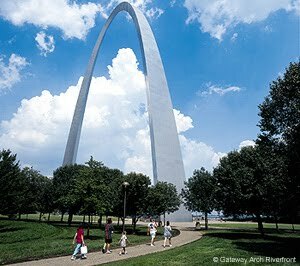 St. Louis summers are some of the most hot and sticky that I can remember. Ohio has some hot, dry days, but they always eventually give way to cooling rain and even some days that feel like early September. But St. Louis summers never seem to let up: it's hot and muggy and muggy and hot and get your outside stuff done in the early morning or evening because the rest of the day is going to be hot and muggy. Also, the next day: hot and muggy. Coffeewife and I had a window air conditioning unit that was our salvation during those months. I was already set to spend the height of each hot and muggy day inside, so I wasn't too worried about this. There was one major requirement that I needed to complete before graduation the next spring: Clinical Pastoral Education. Clinical Pastoral Education (CPE) is a program whereby one is immersed in a setting as a spiritual caregiver--usually a hospital or similar facility--and is encouraged to reflect on one's actions, reactions, decisions, and experiences in that setting with a group of peers. I was set to do a 10-week intensive summer unit at Forest Park Hospital in St. Louis, both to fulfill a seminary requirement for a 400-hour unit of contextual education and my Association's requirement for ordination. I'd heard plenty about CPE before this time started. Some who'd taken it loved it, others hated it. There's an incredible amount of vulnerability involved in sharing, which makes a lot of people uncomfortable. You're in this environment where you're told to analyze your decisions, personality, sense of self, and even your past with this group of people you've just met. So yeah, it's not enjoyable for a lot of people. I'd been told some horror stories beforehand, which were usually variations on the theme of having a half-dozen other people rip apart your motives, theology, or sense of call. I remember the anxiety that I'd felt that first day. As I sought out the room designated for our meetings, I had scenarios running through my head of five or six other white guys my age, all much more conservative than me, tearing me a new one on a daily basis. As my fellow students wandered in, however, I began to feel some relief that this would not be the case. There were three women: a Latina nun in her 60s, a younger Catholic seeking an M.Div, and a young black woman from an Illinois Bible college. And there were two other men: a guy in his 30s or 40s who would take his final vows in a Catholic religious order before too long, and a middle-aged guy from the Missouri Synod Lutheran seminary. There was quite a diversity around the table, and I began to relax a little. CPE requires each student to come up with goals for the summer, the idea being that one is intentional in his or her daily interactions about engaging in behaviors to help meet them. So if your goal is to be more outgoing in conversations, you make it a point to push yourself to keep asking questions or offering something about yourself when talking to others. As part of this process you write verbatims, which are recollections of an interaction you had with a patient within the past week, along with some reflections. Then you come back for your peer sessions, and everyone else picks apart your verbatim in terms of your goal. So again, if you want to be more outgoing in conversation, the group may pay special attention to how you did along those lines. My goals that summer had to do with risking and asserting myself in interacting with others. I won't go into this in tremendous detail because I don't think the average reader may be incredibly interested. I will share one turning-point moment when I presented a verbatim. I was asked about why I did or didn't do something with my patient, and I responded that I wasn't sure about pursuing that topic or something. My CPE supervisor flatly said, "It sounds like you avoided a risk," at which point he got up and left the room. Our session was over, and I was set to go home with that comment dangling in my brain. Welcome to Clinical Pastoral Education. One aspect of CPE that I loved was interacting with patients. I met so many interesting people that summer. There was the older lady who, when I invited her to pray with me actually prayed for me and gave thanks for my ministry. There was the middle-aged pastor battling cancer who had a pager that would go off every time one of his congregants prayed for him. There was another older woman with cancer who was there most of the summer, where at one point all we did together was hold hands and watch TV. There was a man with some dementia who'd tell me all about the angels he saw, which he called "the welcoming committee." There was an older couple, both patients: the wife died at the hospital. The husband, battling cancer and now without his lifelong companion, was going to be moved to a care center where he was prepared to accept his fate. I was present during a death for the first time, prayed for another freshly grieving family, and helped a third family make life support decisions. I was privy to such a wide variety of experiences and people, and all of it was amazing. When it was all said and done, CPE was one of the most beneficial, rewarding experiences that I had in seminary. I came out of those 10 weeks feeling noticeably different, and I like to think that those feelings translated into real, changed behaviors over the next year and beyond. This summer wasn't all work, of course. A group of friends were all going through CPE at the same time, so we'd not only process our experiences together, but we blew off steam together. We were in St. Louis, so there was no shortage of ways to do this. We saw musicals in the free seats at the Muny, the outdoor theatre in Forest Park. We visited museums. We took rides through Grant's Farm. We watched fireworks on the 4th of July. We ate frozen custard or shared wine in the cooler summer evenings. We played ultimate frisbee on Saturday afternoons. This was the stuff that kept us sane in the midst of these intense moments that we had most weekdays. I also expanded my musical horizons a little. Having been a huge fan of Dave Matthews Band, I'd begun to hear about other so-called jambands, and started to listen to them more. Among them were the Grateful Dead, Phish, Gov't Mule, and Widespread Panic. Panic was the soundtrack of that summer. I downloaded a couple of their live shows and picked up their album Don't Tell the Band. DTTB was usually both the last thing I heard before entering the hospital and the first thing I heard upon leaving it. I still associate that album with that summer, reliving those experiences whenever I hear "Little Lily," "Action Man," and "This Part of Town." In particular, "This Part of Town" seemed to fit the work I was doing and what I was learning, and for me epitomizes what that summer meant.